Fixing the Underpass, How Low Can You Go? I am sorry to report I missed Wednesday evening’s planning fest for fixing what ails the city’s State Street underpass. Apparently more than 100 people showed up at the Community Arts Workshop on Garden Street, which was all about what kind of art would be cool in the underpass. By all accounts, a good time was had by all. Participants are reportedly still giddy with exhilaration from the experience. And how many times can that be said? Lots of ideas. Positive suggestions on how to make the underpass cool, hip, and mellow. Flashing lights that track motion. Murals. You name it. Everything but a choir of accordion players at one end and bagpipers at the other. The point is to connect the stretch of lower State Street where the dirty book store–tattoo parlor–nail salons live with the even lower part of the street where the new Hotel Californian has just erupted. And, of course, there’s the always throbbing heart of the Fun(k) Zone, where the good times roll almost as freely as all the upscale artisanal libations. City administrator senior assistant Nina Johnson is trying to figure out how to maintain the flow from the bottom of the street — where the action is — to the upper portions — where the action decidedly isn’t. Even though the State Street underpass — built in the 1990s by Caltrans — is wider than the rest of State Street, it functions as a pinch point and doesn’t encourage the flow of human traffic from points A to B. Conspicuously absent from Wednesday night’s gathering was any exhumation of Pearl Chase’s ghost or any creatures out of Santa Barbara’s historical closet, red tiles or white stucco. Johnson was the guiding hand behind the Wednesday night shindig, and most strategically and unusually — as in never before in human history — she got an anonymous donor to donate some wine. No doubt everyone would have been there anyway. No doubt they would have all been just as engaged. But it didn’t hurt. Next time, bring beer and I’ll show up too. The bigger point to applaud is that this was a gathering to talk about what people affirmatively want to see fill the void rather than yet another group gripe about the homeless, the street people, and da bums who are turning State Street into the Second Coming of Calcutta. The other shoe has now officially dropped. The worst-kept secret in Santa Barbara County has been revealed: 2nd District Supervisor Janet Wolf is not seeking reelection. Wolf confirmed her decision to Independent reporter Kelsey Brugger late one evening, leaving the 2nd District seat up for grabs, like immediately, even though there are 13 months left on her third and last term. The corollary to this revelation is that Santa Barbara City Councilmember Gregg Hart will soon be running for Wolf’s supervisorial seat. Making this somewhat awkward, Hart was just reelected to the council last Tuesday night. What bugs is that Hart was never straight up about it during his alleged race against upstart Bernie-Krat Jack Ucciferri, who sought without success to make Hart’s political wanderlust a campaign issue. It might have helped had Ucciferri — whose twitchy intelligence requires a double dose of Ritalin for those hoping to keep up with him—been able to raise more than $4,000 to run against Hart’s $144,000. Hart is the consummate political professional, smooth, precise, and extremely smart. Once Mayor Helene Schneider steps down in January to make way for mayoral-elect Cathy Murillo, Hart will be — however shortly — the most procedurally adroit player on the council and by a magnitude of many moons. 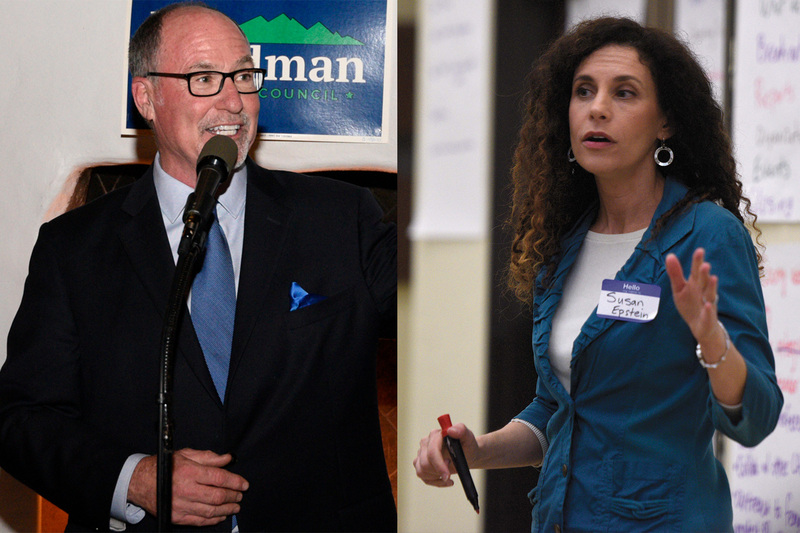 Should Hart prevail in his bid for the 2nd District — Goleta school boardmember and longtime progressive activist Susan Epstein has made no secret of her interest and is unlikely going to go quietly into Hart’s good night — the City Council’s procedural prowess will plunge a few points. Not only that, the council will have to appoint Hart’s successor. That will bring the number of appointed councilmembers to two, the first being whoever the council chooses to replace Murillo — who represents the council’s Westside district — when she’s given the mayor’s gavel this January. No doubt there’s historic precedent for two appointees serving as councilmembers, but not that anyone still alive can remember. How this all shakes out, who knows? District elections proponents insist the vacancies need to be filled via special election; City Attorney Ariel Calonne insists more vehemently that the city charter requires these vacancies be filled by council appointment within 30 days of the vacancy. Elections, it turns out, are expensive to hold, especially special ones. In fact, that might be the most compelling reason the City of Santa Barbara ultimately decides to switch its election schedule from odd years to even ones. It turns out so few cities still hold their elections in odd-numbered years that the only private company in the state that currently administers them is about to go out of business. If the County’s Election Division were to take over, it would cost the city $300,000 more than it does now. Far cheaper to switch to even years. Voters tend to show up in greater numbers as well, by far, though it’s unclear how many make it to the bottom of the ballot where the city elections are.